Each peer group is slowly taking ownership of different aspects of Bibliopolis. The 3rd grade girls have taken on the Bibliopolis succulent garden. The middle school guys are slowly but surely going to head up the vegetable farming. And today I introduce the 6th grade girls dynamic duo that is our new Bibliopolis Recycling Committee. You’ll start seeing signs (I promise, I didn’t make them) around Gracepoint Berkeley church that request your rinsed out and uncrushed cans and bottles. What are we fundraising for, you ask? 100% of the proceeds will go towards books and future bookish outings or events. 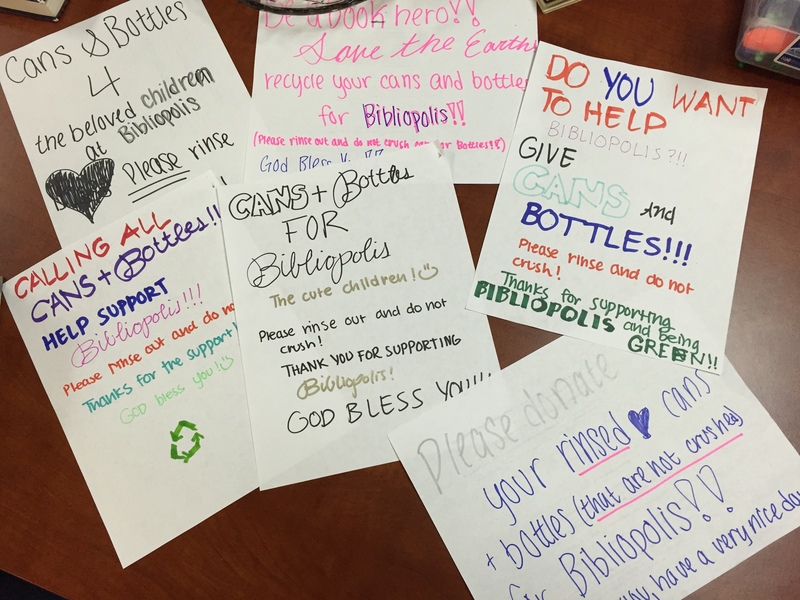 If you’d like to support the fundraising efforts even further, you could collect cans and bottles at home, and bring your recycling to Bibliopolis! This entry was posted in Bibliopolis and tagged books, fundraiser, library, psa, public service announcement, recycling by hemilykim. Bookmark the permalink. While I appreciate the reminder regarding our drought, we do appreciate a quick rinse of sugary drink containers so as to prevent our crawling friends, the ants! The committee realizes that crushed cans and bottles are OK as well. Either way, we appreciate your recyclables.